The M18 FUEL 3/8 in. Compact Impact Wrench features a POWERSTATE Brushless Motor that delivers 0-2,500 RPM & 0-210 ft-lbs of fastening torque with constant power output under heavy load. REDLINK PLUS Intelligence is the most advanced electronic system on the market, preventing damage to the tool and battery caused by overloading or overheating. REDLITHIUM Batteries deliver more work per charge & more work over the life of the pack than competitive batteries on the market. Compatible with ONE-KEY, this is the industry's first Impact Wrench that wirelessly connects to a smart phone to Customize, Track & Manage a tool's performance and location. Unlimited Tool Customization allows you to connect to the tool and access predetermined set-ups for specific fasteners & materials, or have complete control over output speed & power for the application. Once desired output performance is reached, the custom profile is saved to the memory of the tool and connection to smart phone is not necessary. The M12 FUEL 3/8-inch Impact Wrench optimizes torque in tight spaces and offers an up to three times longer motor life, up to 50% more runtime, and proprietary Milwaukee 2-Mode DRIVE CONTROL for better control over the power and speed required for specific applications. The POWERSTATE brushless motor outperforms all leading competitors with constant power output, yet runs cooler with no wearable components. The onboard fuel gauge helps you monitor the charge more accurately, so there's less downtime on the job, and the REDLINK Plus Intelligence ensures optimized performance and protection from overload, overheating and over-discharge. The wrench also provides up to 1,400 inch lbs. of torque. The M12 Cordless 3/8" LITHIUM-ION Ratchet is the most compact and powerful ratchet in its class. At only 10-3/4" long and 1.9 lbs, this lightweight tool is the ideal fastening solution for automotive mechanics and maintenance & repair professionals desiring maximum performance, portability and productivity. The compact 3/4" low profile head design allows users to work in the tightest of spaces or engine bays. The M12 Cordless 3/8" Ratchet utilizes a powerful 12V motor to produce up to 35 ft.-lbs. of torque and 250 RPM, giving users the power and speed of a pneumatic ratchet with freedom from the air hose. The variable speed metal trigger and reinforced steel housing provide maximum control and durability with any application. The 2457-20 delivers best in class power, speed, and durability in an extremely compact form, maximizing productivity for the end user. Optimized for the professional who frequently encounters precision fastening applications, the Milwaukee M12 Compact Driver delivers unmatched precision, power and portability along with a slimmer, more ergonomic grip. A variable speed trigger and 0-500 RPM gives unrivalled fastening control, 15+1 clutch settings prevent over tightening fasteners, and 175 inch lbs. of torque provides the ability to accomplish tough applications. At 6 1/2-inches long and weighing only 2.0lbs, its compact, lightweight and durable design provides greater comfort and fits in tighter spaces on the jobsite. M18FUEL ONE-KEY 18VLi-Ion BrushlessCordless 3/8in.ImpactWrench w/FrictionRing Kit w/(2)5.0Ah Battery The M18 FUEL 3/8 in. Compact Impact Wrench features a POWERSTATE Brushless Motor that delivers 0-2,500 RPM & 0-210 ft-lbs of fastening torque with constant power output under heavy load. REDLINK PLUS Intelligence is the most advanced electronic system on the market, preventing damage to the tool and battery caused by overloading or overheating. REDLITHIUM Batteries deliver more work per charge & more work over the life of the pack than competitive batteries on the market. 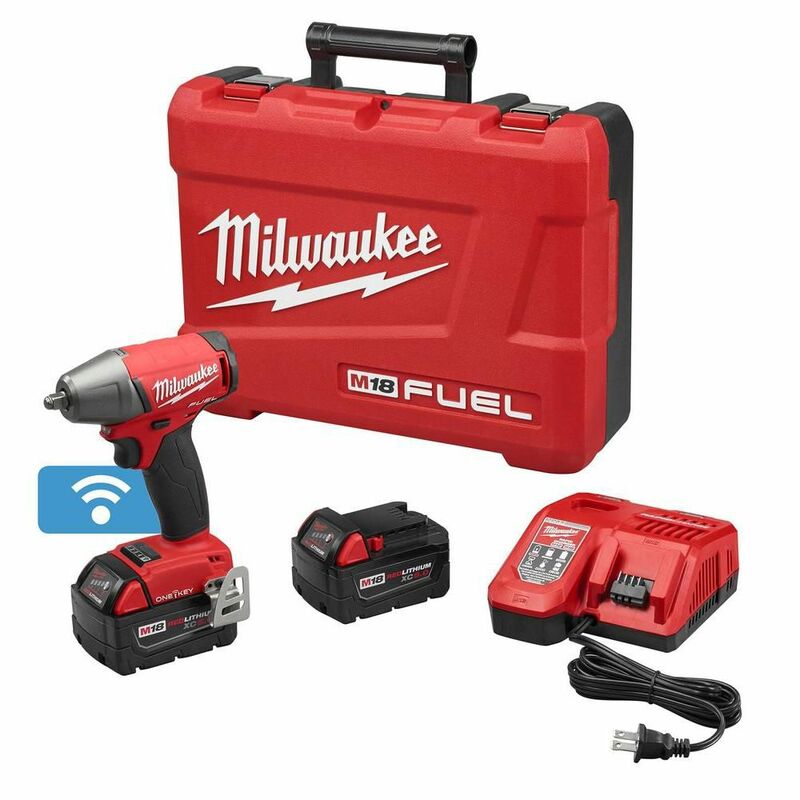 Compatible with ONE-KEY, this is the industry's first Impact Wrench that wirelessly connects to a smart phone to Customize, Track & Manage a tool's performance and location. Unlimited Tool Customization allows you to connect to the tool and access predetermined set-ups for specific fasteners & materials, or have complete control over output speed & power for the application. Once desired output performance is reached, the custom profile is saved to the memory of the tool and connection to smart phone is not necessary. M18FUEL ONE-KEY 18VLi-Ion BrushlessCordless 3/8in.ImpactWrench w/FrictionRing Kit w/(2)5.0Ah Battery is rated 4.9 out of 5 by 7. Rated 5 out of 5 by Pinong from This impact wrench is very powerful for its compact size. With its 2 batteries, it will last you ... This impact wrench is very powerful for its compact size. With its 2 batteries, it will last you all day. With this tool power you can remove a lug nuts very easy on a compact car. And powerful enough to get truck lug but also. It came with a hard case, free compact sockets. Charger. This tool is great , if you have a money. Get this tool on your collection. Rated 5 out of 5 by DiyhomeMechanic from Great tool, great for all around automotive work, Great tool. I use it when working on cars. Milwaukee is a good company to deal with if you have any problems. They make solid tools and this thing is fantastic. I owned the 2754 and upgraded to the 2758. I love the idea that I could customize the settings to my needs. I have the big boy, the 2763 but hardly ever use it. 95% of the bolts come off with the 2758. I take off lug nuts, remove caliper mounting bolts, slide pin bolts, and various other suspension bolts using this tiny thing. Great power yet compact enough to work in tight spaces. I use mode 4 for taking off lug nuts, I use mode 3 to tighten them. Now, mode 3 I have it customized to run at 1900 rpm and level 7 on the torque meter. I think with this level, I'll tighten the lug nuts around 100-140 lbs. most lug nuts on car wheels are torqued to 85-100 foot pounds depending on the car. So 100-140 foot pounds is tight enough for me. If it's your car, you can torque it down using a torque wrench exactly, but when your dealing with cars coming in and out in a hourly basis, this setting is good. Most mechanic shops or tire shops will just tighten the wheel bolts/nuts using a high power pneumatic(air) wrench just hammering away, tightening way over 200-300 foot pounds, which is major overkill, but using this thing in my custom mode 3, it usually over torque it just a little bit. I think it's a great tool for anyone working with cars.